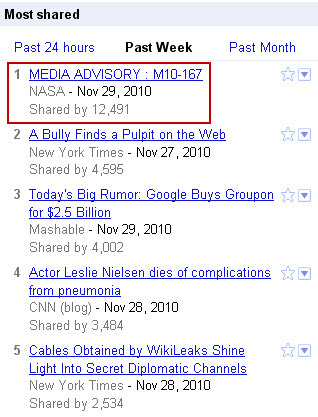 In reading a post on Google Operating System about the Most Shared section on Google News I found it interesting that a press release from NASA was among the leaders. Press releases tend to be the ugly stepsister when it comes to Google News visibility but here’s a sign that they do sometimes get traction from users. But jokes aside, if you have something of genuine interest to announce people will pay attention and spread the word. I find the use of press releases for SEO in general a bit of a red herring. Yeah, sure, they work to increase rankings, but the effect tends to be short-lived. Good points Amelia. In the past people have used press releases as a basic form of link building too. The SEO value of that tactic is now fairly limited but it is still helpful in certain cases, as Bill Hunt pointed out a while back. But when issuing press releases for legitimate reasons there are still opportunities to increase their visibility through Web search, news search, social media, etc. Can you offer examples of this approach being useful for a small company without the huge worldwide brand recognition that Sony has? My clients aren’t household names, so I suspect that this approach could offer a small benefit, but nothing on the scale that the Sony example shows. I know I’m being a bit of a ‘killjoy’ it’s just that so many so called ‘experts’ in SEO flount this kind of information without applying pure common sense – a press release from Sony about an eagerly awaited product is going to gain momentum (my Gran could tell you that!). A press release from a relatively unknown niche insurance provider is never going to gain that kind of exposure… surely? Yes, I’d say Bill’s example is most relevant to large companies and particularly those with a tech focus. But it does happen in other categories too, especially with smaller and local news outlets. To be clear the aim of my post was not to suggest that press releases are some form of great SEO tactic that everyone should be employing. I just wanted to point out while releases that get indexed in Google News don’t typically gain a lot of visibility, every now and then they do. I’d also say that a significant portion of the press releases that are produced every month probably never needed to be created in the first place, and all companies (large and small) are often better served by focusing on other marketing communications efforts. In the examples you refer to a press release may not be the way to go at all; it does depend on the situation and the “news.” But when press releases are a logical fit there are ways to expand their visibility online and extend their use beyond distribution to media professionals.